Most of us are always looking for a new and different salad to shake up the holidays, or even a weeknight dinner. The addition of dried fruit is a pretty and flavorful way to make a green salad much more special. This one includes chopped dried apricots and dried cherries, which provide a burst of tart sweetness, some color, and lovely chewy texture. The the whole thing gets topped with some crumbled cooked bacon (which has never not made salad – or anything else – better), as well as some crumbled goat cheese, which you can buy already crumbled, or just crumble yourself (or let the kids do it). Speaking of which, the dressing is easy for the kids to measure and shake up, and they may even be able to slice up the romaine with an age-appropriate knife. Think of this salad for Thanksgiving, or whenever you need to spruce up a holiday table or a buffet. If you bring the dressing on the side, it makes a great potluck offering. Just dress and toss the salad right before serving, and bring along the cheese and bacon for sprinkling. In a container add the shallot, red wine vinegar balsamic vinegar, olive oil, and salt and pepper. Shake to combine. Thinly slice the romaine hearts crosswise. Turn it into a large bowl, and add the spinach, apricots, cranberries, and toss. Pour over the dressing and toss to combine well. Turn it into a serving bowl, or serve into individual salad bowls, and top with the goat cheese and bacon. 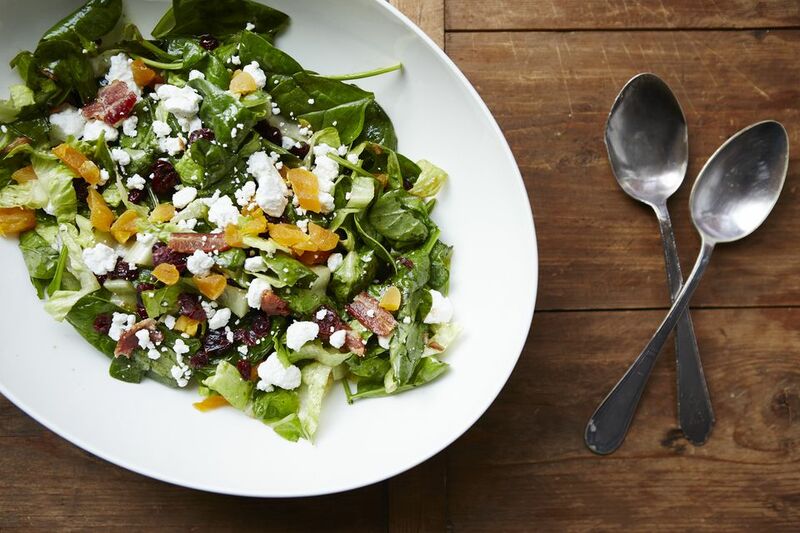 Turn it into a serving bowl, or serve into individual salad bowls, and top with the goat cheese and bacon.